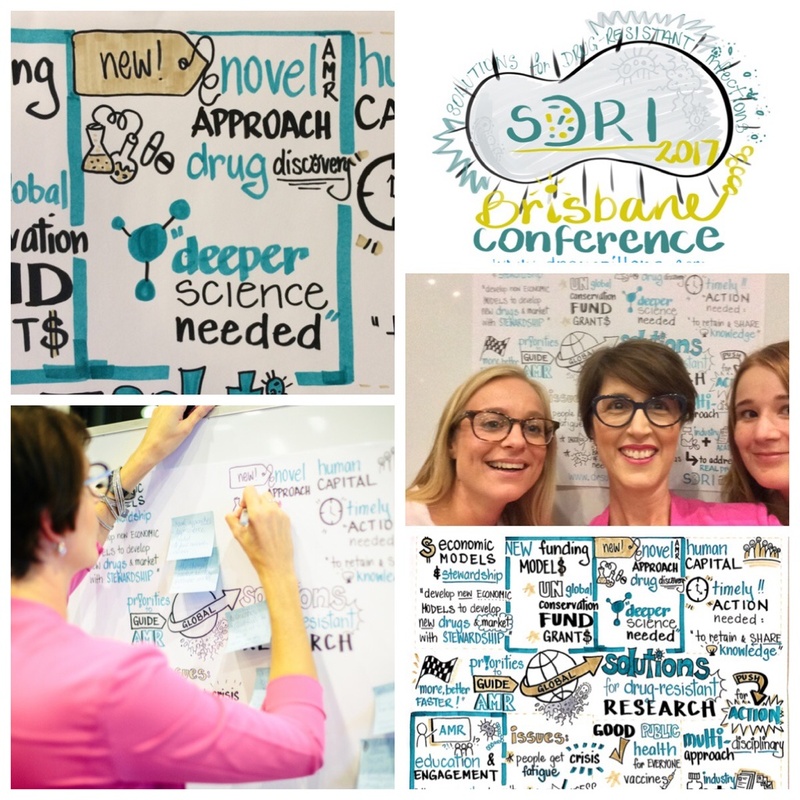 I had the great opportunity recently to be the Graphic Recorder for the Inaugural “Solutions for Drug-Resistant Infections” (SDRI) Conference held in Brisbane. I was there to draw out the Panel discussions and priorities to guide research efforts towards global solutions for drug-resistance research. Conference attendees voted on the top three research priorities which you can see pictured in the visuals! To see the highlights of this multi-disciplinary scientific conference for the Asia-Pacific region take a look at the SDRI Storify. I am being asked to work more and more in the health space as visualising complex issues can help people to see the big picture. Having me there to help draw out controversial and sensitive issues also shows groups and stakeholders that they are being listened to and that their stories are important. My role in any group discussion/forum is to listen for the key messages, draw out the synergies and differences and put people in the picture. Recently I have also pictured the stories of those with Lived Experience (suicide) and the impending challenges of Aged Care. You can see more of how I work with people to put Community & Health in the picture. I help people to put their ideas, issues and information in the picture through visual storytelling and you can see more of my work @suepillans on Twitter and Instagram and via my alter ego Dr Suzie Starfish. ← Some GREAT Barrier Reef news!! Wow Sue. What can I say – I’m so impressed. You must be incredibly proud of the work you’re delivering and the organisations you’re working with.